(From Nikon lens literature) Excellent, fast aperture zoom lens for general photography. Push-pull type zoom is ideal for zoom effects during shooting. Distortion is well controlled throughout range. Relatively fast, wonderful optics, small size, solid build...like a tank!, Macro in a pinch. Rotates w/ focus. Push/pull zoom...which I like but some hate. Auto focus is a bit slow by today's standards. 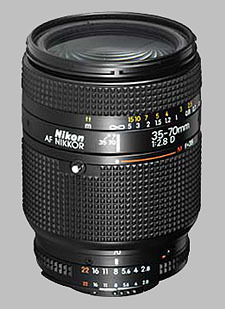 I've used this lens for just about everything....landscape, fine art, weddings, portraits, commercial shoots and more. It has never failed me. Built like a tank, small size, w/ an about perfect mid-range zoom capability. Works well on crop sensors too. It is almost always on one of my Nikon bodies and I also use it on Fuji and Sony bodies, w/ adapters. Sure, some modern lenses are a bit sharper but none deliver the goods in such a small, bullet proof package. I've owned it at least 10 years and will probably still have it in another 10. I had this lens (new 1990) on my F4s for two years, the images were very good, but the push-pull zoom was heavy and uncomfortable - I had to rest the camera against my forehead to move it back. Also, the rotating front focusing group was very wobbly in my copy compared to other examples I came across. The image in the finder moved around. The lens was returned to Nikon who applied heavy grease on the helical threads where no grease should have been applied. The result was a very sluggish AF performance and heavy battery drainage. I got rid of it. Very sharp, solidly built still able to compete image wise. After selling my DX gear I needed a good lens to replace my then favourite lens, the 17-55mm f2.8 DX. I bought one of these old lenses because of price and reputation while waiting for a well priced 24-70mm to turn up. Having previously had some zooms from this era I always had a high regard for Nikon's lenses from the 1980/1990 era. I have never had a problem with it and apart from its limited zoom range have never had any complaints about it either. Eventually I bought a 24-70mm f2.8 and that is now my main lens for my D700. But I still have the 35-70mm because it's useful for times when either I do not want the extra size and bulk of the newer lens or because I am taking the lens into a place where it could be damaged and do not wish to risk the new lens. I have to say that within its limits its virtually impossible to distinguish a shot taken with the 35-70mm from a shot taken with the 24-70mm in most instances. (Maybe a pixel peeper can but I do not bother with that stuff). I have seen a review somewhere which showed images side by side from the two lenses and it was clear with those images that there is not much between the two in terms of resolution and sharpness at least. If you want a relatively inexpensive lens for a late model Nikon camera this one is hard to pass by. It is still a keeper. Flare is a problem; fogging is significant in some examples, but is easy to remove. Despite a fairly limited focal length range and old-fashioned push-pull focal length selection, this is a very useful lens. The biggest problem is flare. But the long hood that you can buy cheaply, or just hand shading the lens when shooting toward the sun, pretty much removes that problem. Fogging is common in this lens, for some reason. But professionals can easily remove it, leaving you with a good, sharp mid-range lens. Many zooms contain this range. But for those who concentrate around the mid-range (for FX) and mid-range to mild zoom (for DX), it's a handy piece of equipment. It's very sharp at all focal lengths. I've had this lens since new and used it for several years on film bodies. I keep thinking about upgrading for zoom range, but the 35-70 keeps producing superb images. The hood stays on it to defend against flare. This is a bright, extremely sharp pro-grade lens that need never be updated in your kit. The price I paid new was a bargain then and the price used today is certainly a bargain. Be careful in that some used models seem to have haze and fungus. Look closely, then be ready for one of the finest lenses for the money you can purchase. Even though I can write off a resplacement and upgrade to the 24-70 f/2.8, I feel no need with this lens in the bag. It's not about money. It's about sharp image quality across the plane. It's about clear, crisp and biting quality you get with some Nikkor lenses. Combined with the Nikkor 16-35 f/4 and the wonderful 2-ring 80-200 f/2.8 you have a killer pro kit on a budget that can stay with the trinity all day long for not much more than one of the trinity. As I get older and maybe retire from paying photography, I might move to more VR lenses. My hands aren't as steady as once were. Even so, I doubt I'll update the 35-70 f/2.8. You have to use it for a while to appreciate what you get here. I don't find the macro mode particularly useful. It's only at 35mm and disables autofocus. I don't find the macro IQ much to write home about either, so I'd not consider it an benefit even in an emergency. This a great inexpensive lens. I use w D7000. I disagree that its not for digital age. I get great images w lens. I use the con of lens flare creatively as its my only lens without great flare reducing coatings. An attractive inexpensive alternative to to a 24-70. I bought mine at KEH. Excellent lens for film/FX . I used this lens for Landscape photography. Excellent overall IQ; high quality construction; "emergency macro"
I bought this lens to use as a "portrait zoom" to fill in between my very sharp Tamron 17-50 2.8 and my Nikon 80-200 2.8 in a compact three lens journalism kit. It fills the bill nicely. Between 35 and 60mm, the lens is superb rivaling the best Nikon portrait lens in quality. From 60-70mm the lens loses contrast, and tends to expose "hot" due to glare (but without overexposing in AF on my D300). I keep a macro in Capture NX to run exposures throgh taken at this length which reduces exposure and adds contrast. The lens is extremely well built, as were most good lenses back in the late '80's when this lens was first introduced. Prices for used lenses have gone up since Nikon introduced the D3 and especially the D700, as these lenses are ideally suited for the full frame format. So, all in all, less of a bargain than it used to be, and with its quirks....but excellent optics overall, with the "character" of the better old Nikon portrait lenses. If it meets your needs, I can recommend it. I've got it used for my D40 as a portrait lens. I was aware of the autofocus issue but decided that I'd always get my money back by selling it anyway. After having used it for a couple of months, I decided to keep it. Build wise it feels very solid and heavy with its all-metal construction although its push-pull mechanism seemed a bit stiff to me, but it's okay now. Zoom ring is well calibrated and after a bit of practice I've rarely missed focus, even using a cropped viewfinder of a DSLR. On a 1.5x crop DSLR, this lens provide a normal to moderate telephoto angle of view which is okay for portraits and even everyday shooting - if wide angle isn't necessary. IQ wise it's about as sharp wide open as the kit lens at f/8 (35 mm). No signs of corner softness or vignetting. Bokeh is very nice indeed. In my opinion, it has some sort of "watercolor" look. It's a tad worse when stopped down though. Actually, there's not much to complain on. The "dinosaur of the film era" performs surprisingly well, even on digital. Now we've got FX digital bodies from Nikon, and the demand for this lens will be high IMHO. Those babies are already out of stock at B&H. The cheapest way to have professional results! I use it for B&W film with a N80/F80. I plan to keep it for ever with my N80 and sell the rest of film bodys and lenses that I no longer use. I have very good results all the way at all apertures, my unit is a bit soft in the right lower corner at 35mm 2,8 but that's all. Compared to my 28-105mm it's a lot better, that one had more softer corners wide open and had more distortion and less defintion. I like "near subject wide fotography" with blur background (for that Magnum look portraits) so I just put f:3,3 or f:4 to be sure and start shooting at everything for sharp results. I forgot ones about the program and shooted one entire film at f:2.8 for architectural and my 24x30cm prints look great so is sharp enough wide open. It's almost distorsion free (not noticeable in general photography, however I didn't do any wall test) and I do a lot of architectural photo so this is important to me. Some people look for it as a portrait lens, and I'm sure it will do a good job on a digital 1.5 factor because it's very sharp, but i'll never buy it for that use since the new DX lenses like the 18-70mm are also very sharp and even the kit 18-55mm is super sharp in the center so my advice is save your money for somthing more useful. Construction is very good and even if I don't like the push-pull zoom I got used to it. I didn't had any dust problems because of the push-pull zoom. It's perfect weight! lighter lenses have less inertia so it's difficult for me to handhold so steady (but normally others think it is a bit too heavy). The bad news : a loot of flare and ghosts! but this is also there for the 28-70mm 2,8 be aware (maybe only a bit less) so use the hood and skip front lightsources. I use a custom made (just black cartoline tube) hood for the middle and long end when doing portraits or studio because the original hood is only useful at 35mm. It can be critical when using light sources in front of the camera, if only the light hits directly the lens you looses a lot of contrast. In Macro mode I had cool results with a bit soft corners that never bodered me. The macro mode only works in 35mm and it's there just in case. Buy a second hand 55mm micro nikkor for almost nothing for cheap sharp macro. Because I still shoot film, I purchased this lens. I really like the push-pull zoom function compair to the rotary on most zooms. It's only draw back is it is quite heavy, and after you spent an hour or two with your camara and this lens around your neck to feel it. But the photos it delivers are tack sharp. This lens is actually "too sharp" for many portraits. One should kick the tripod while tripping the shutter when photographing ladies - if one expects to get paid. However, if one is working on location photographing fast-movers (children), then consider the AFS 28-70mm 2.8 (which is the update to the 35-70mm). This dinosaur was the pro lens of the 135 film era. It's range is not that useful on a digital crop camera, but it may be used as a portrait zoom. The lens is sharp even wide open and improves even further up to f/5.6. Unfortunately it is very susceptible to flare and ghosts, for strongly backlit situations it is nearly useless. Always use the lens hood and keep direct sunlight off the front lens. Color rendition is good, contrast is a little low at 70mm wide open and very good otherwise.Bokeh is neutral. My sample had slightly undercorrected spherical abberations at 70mm wide open at the near limit, which could be used reasonably for portraiture, but it may also confuse auto focus. AF speed is fast for a screw driver type AF. This wonderful lens used to fit solidly into the Nikon film-era line-up of 20-35, 35-70, 80-200, but Digital has messed all that up, and the 35-70 has become an orphan. Hence, these little gems are dirt cheap. You might consider it if your wide end is 12-24, but most people will go 18-70. Shame, because this is truly pro-quality glass.